It is our policy and our privilege to give to outstanding children's charities on an ongoing basis. The current ‘Internet age’, almost every expecting mother has gone on-line to research every aspect of their pregnancies – including symptoms, diet and exercise, the chance of having a boy or girl, baby names – just about everything. 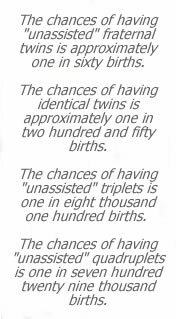 When you have twins (or higher multiples) there’s information regarding the chances of having twins, genetic factors in having twins – and an abundance of information on why twin pregnancies are in the ‘high risk pregnancy’ category. One of the most devastating diseases parents of monochorionic (identical) twins can face is Twin to Twin Transfusion Syndrome. Basically, TTTS occurs when the placenta does not function correctly. The result is one baby who receives more blood and more nourishment at the cost of the other baby. There is a very high fatality rate among TTTS pregnancies. With my own research on the topic, I faced each ultrasound with a mixture of anticipation and a sense of apprehension - the joy of “seeing” my two (already beautiful!) little boys again, and the uncertainty that something might be wrong. The dreaded TTTS was never far from my thoughts during the second trimester of our pregnancy. While we did not have to face TTTS, we know of others who have. When one of our customers shared with us their heartbreaking experience with TTTS we decided to do what we could to help other families facing the disease. One dollar of every shirt sold from our site is donated to the Twin to Twin Transfusion Syndrome Foundation (TTTS Foundation). TTTS Foundation is dedicated to providing immediate and lifesaving educational, emotional and financial support to families, medical professionals, and other caregivers before, during, and after a diagnosis of twin to twin transfusion syndrome. We encourage you to visit their website and learn more about the difference these folks are making in the lives of families facing this devastating disease.